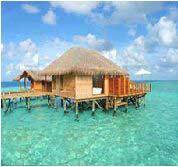 Located southwest off the southern tip of India, the Maldives (pop. 345,000; GDP/cap US$2,687) is composed of groups widely dispersed of islands. The Maldives was one of the victims of the December 2004 Tsunami, causing an estimated US$300 million in damage. The country draws its income from tourism and from fishing. Maldivian authorities worry about the impact of erosion and possible global warming on their low-lying country; 80% of the area is one meter or less above sea level. Foreign investors are not allowed to own land, but are granted lease rights ranging up to 25 years, which can be later extended to 35 years for investments over $10 million.